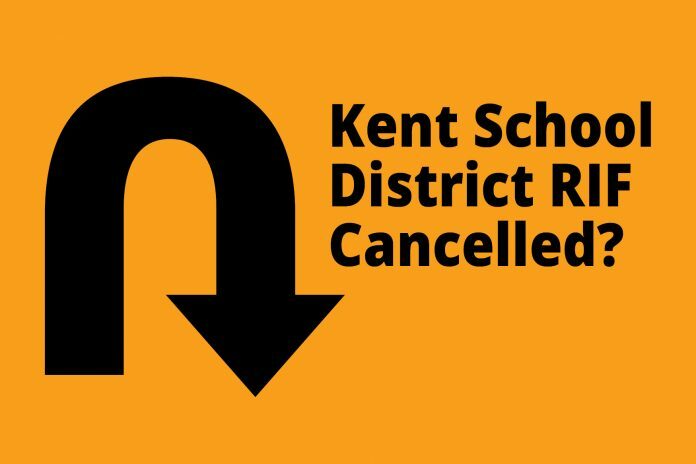 In a press release late Friday, the Kent School District (KSD) announced that the planned reduction in force (RIF) may be cancelled because of a change in State funding linked to HB 6362, signed into law on Tuesday, March 27 by Governor Inslee. Leadership announced that a reduction in workforce will be through natural attrition rather than the previously announced 127 FTE RIF. This new path is a U-Turn from the district’s highly controversial decision announced earlier in March. Part of KSD’s press release follows. “After Governor Inslee signed HB 6362 into law on Tuesday, March 27, OSPI then updated the statewide multi-year tool; these updated numbers confirm that the Kent School District will receive approximately $75 million in revenue. This week after HB 6362 was signed into law, KSD received additional information from OSPI that has caused us to re-evaluate our financial savings strategy. What KSD must consider in addition to this confirmed revenue includes: a loss of local revenue of approximately $19 million dollars in 2018-2019 and an additional loss of $12 million dollars in 2019-2020; categorical spending restrictions placed upon a significant portion of this new state revenue; the implications of bargaining compensation with five labor groups in 2018; achieving and sustaining a 5% minimum ending fund balance long-term, as required by policy; and continued changes in legislative funding and laws impacting schools. “All of this considered, looking ahead at the now-confirmed increased revenue has led us to review the level of reductions we planned to propose to the Board of Directors on April 4 at a special meeting. “As a result of the re-evaluation of district revenue, KSD will be eliminating 60 FTE from KEA through natural attrition as opposed to the 127 FTE originally forecasted for a RIF, an allocation that was based on preliminary revenue numbers. An elimination of 60 FTE means that KSD will not be required to implement a RIF for teachers. This development will probably be one of the topics covered when the district begins its four “Community Conversations” meetings at the four district high schools beginning April 16. Four more information, see Mid-April Conversations.